‘Bizaardvark’ Series Finale Airs Tomorrow Morning – Watch A Clip! | Bizaardvark, Exclusive, Madison Hu, Olivia Rodrigo, Television | Just Jared Jr.
Can you believe that Bizaardvark is actually ending?! JJJ has an exclusive sneak peek at the final episode, which airs TOMORROW morning, April 13th @ 10AM ET/PT on Disney Channel. In “The End of the Beginning”, after Red and Grandma’s wedding, Liam informs everyone he must sell the Vuuugle house to pay off his debts. Meanwhile, Paige and Frankie are offered their own TV show in New York. 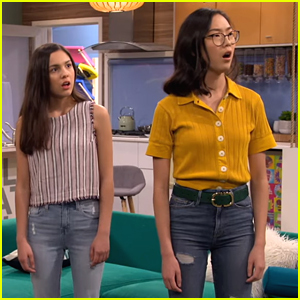 We also spoke to stars Olivia Rodrigo and Madison Hu about saying goodbye to the series. Madison has fond memories of the first ever video she shot with Olivia. Olivia also opened up about what she would take from the set – Bizzy! “The stuffed animal is super cuddly and reminds me of some awesome memories,” she shared. Check out a clip from the final episode of Bizaardvark below!